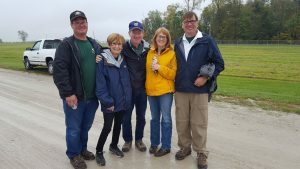 Citizens Advisory Committee member Chris Kline, ethics teacher and Sustainability Director at Culver Academies, shared about our recent trip to County Line Landfill on his blog. You can read about it here! Pictured from left to right: Chad Gard, Lyn Ward, Don Fox, Marianne Peters, and Chris Kline. Chris and Lyn are part of the CAC; Chad and Don are faculty at Culver Academies.